it is displeasing that the Examination Council of Zambia used the teachers to mark the grade 9 exams without paying them transport and lunch allowances , the teachers used their own money for lunch and transport expenses with a view that the money will be paid. But alas, after the marking process, they have gone mute with no formal communication as to why they delay in the payments. in normal circumstances, the money should have been paid on the first day of the process, so that it could be used for the intended purpose. so teachers diverted personal money towards the process and not get paid,double loss. 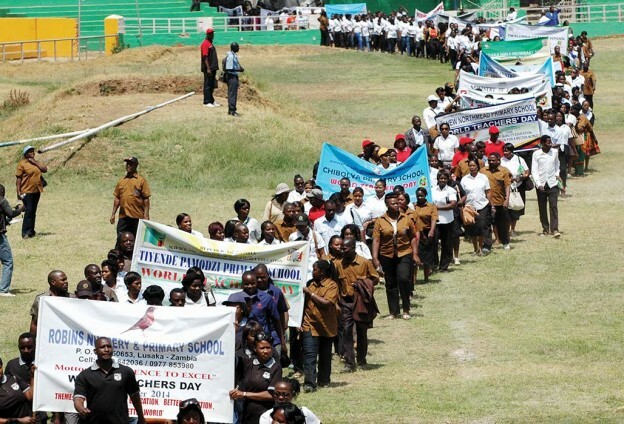 For the unions, well they are very useless and toothless, they have not made any comment on the matter… the only show up on teachers day with Tuma Chinese t shirt.